The death and funeral of Blessed Pope John Paul II and the subsequent election of his successor, Pope Benedict XVI, in April 2005 were momentous events for Catholics around the world. Benedictine Brother Mauritius Honegger was a close witness to all of them, but not as a pilgrim in Rome like millions of people during those historic days. Although he saw up close the events that mesmerized people around the world who watched them on TV and the Internet, Brother Mauritius’ heart was, at least in part, far from Rome. At that time, he was discerning a call to religious life. And before the end of 2005, he finished his two-year commitment to the Swiss Guard and entered historic Einsiedeln Abbey, which is approximately 20 minutes from where he grew up in Switzerland. Now a member of Einsiedeln Abbey, Brother Mauritius spent the past academic year as a student at Saint Meinrad Seminary and School of Theology in St. Meinrad. Einsiedeln, which was founded more than 1,000 years ago, established Saint Meinrad Archabbey in 1854. Since he grew up in Switzerland, knowing former members of the Swiss Guard is not unusual, Brother Mauritius said. He learned about them as he grew up. And when he went to high school at Einsiedeln Abbey, he participated in a pilgrimage to Rome where he met with members of the Swiss Guard. He applied in 2003, and was accepted at age 19. When he began his service in the fall of that year, he went through a month of training that included learning basic martial arts skills. With Switzerland becoming an increasingly secularized country, Brother Mauritius said that men who seek to join the Swiss Guard usually already have a strong life of faith. It is not unusual then, he said, for members of the guard to discern a priestly or religious vocation. Brother Mauritius said that his time in the Swiss Guard prepared him well for religious life. Benedictine Father Urban Federer, prior of Einsiedeln Abbey, visited Brother Mauritius in Rome when the former student of his monastery’s high school was discerning a religious vocation. Father Urban saw many things in the Swiss Guard that can aid a young man’s vocational discernment. But there were challenges to this in the guard as well. Other aspects of his life in the guard were equally difficult, Brother Mauritius said. A lot of the time, he just had to stand guard and do nothing else—for hours. Persevering through the mundane duties that have to be done—even at the Vatican—was another means to help Brother Mauritius prepare for life as a Benedictine monk, according to Father Urban. “He knows what it means to stand on the Piazza of St. Peter for hours without doing anything,” said Father Urban. “Therefore, he had to learn that everything has two sides: A nice one that can be seen by everybody—especially by the tourists—and another one he had to face personally. Such situations strengthen us in our vocation. Although the duties of the Swiss Guard can be a drudgery at times, Brother Mauritius witnessed history toward the end of his time in Rome. On the evening of April 2, 2005, Brother Mauritius was preparing to go to sleep early because he had to be on duty at 4 a.m. outside the entrance to the apostolic palace where the pope lives. He knew that Pope John Paul II was close to death, and could see from his barracks windows large crowds of people keeping vigil in St. Peter’s Square. When he arrived at the apostolic palace at 4 a.m., all was quiet. But he looked at the log that recorded all of the people who had come and gone from the pope’s residence just hours earlier, and saw a long list of some of the most prominent leaders of the Church. A few days later, the casket that held the body of Pope John Paul was carried in a solemn procession from the apostolic palace to St. Peter’s Basilica, where millions of people would soon pay their last respects to the beloved pontiff. Brother Mauritius was a member of the honor guard that accompanied the casket. Later that month, the members of the College of Cardinals eligible to elect a new pope processed into the Sistine Chapel at the Vatican to carry out that solemn duty. Brother Mauritius was standing guard at the entrance to that historic chapel as the princes of the Church walked past him. On the second day of the conclave, Brother Mauritius was on guard at the entrance to the Sistine Chapel when the cardinals left for lunch. A few hours later when Cardinal Joseph Ratzinger was elected pope and took the name Benedict XVI, Brother Mauritius was back in his barracks. Unfortunately, he was on duty so far back that he couldn’t understand the announcement or recognize the new pope standing on the balcony. Another Swiss Guard came to him and told him the news. A few days later, Brother Mauritius saw Pope Benedict up close. He was a member of an honor guard that stood at attention directly in front of the altar in St. Peter’s Square during the installation Mass for the new pope. In the late summer of 2005, shortly before Brother Mauritius left the Swiss Guard to become a postulant at Einsiedeln Abbey, he was part of a contingent on duty at Castel Gandolfo, Italy, the pope’s summer residence. One night, Pope Benedict had dinner with the members of the Swiss Guard. A Swiss religious sister who was a cook for the guardsmen knew that Brother Mauritius was in discernment, and had him lead his fellow Swiss Guards and the pope in prayer at the start of the meal. The sister later told Pope Benedict that Brother Mauritius was going to become a monk. 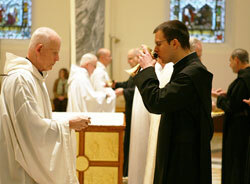 Brother Mauritius professed simple vows in 2007, and solemn vows in 2010. He hopes to be ordained a transitional deacon and priest in the future. He said coming to study at Saint Meinrad was beneficial. Benedictine Father Kurt Stasiak, prior of Saint Meinrad Archabbey, said having a monk from the monastery that founded his community study here was a blessing.